Incandescent are obsolete with the newer lighting technologies that emerged over the years. They have served their purpose since Edison introduced us to them in 1879. 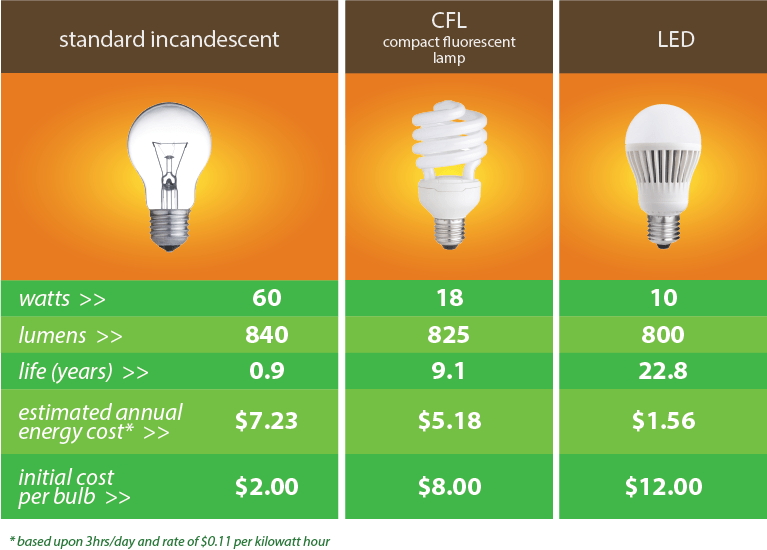 CFLs are a more energy efficient choice than incandescents; however, as LEDs grow in their technology, these are best left on the shelf. They last a long time, but when they burn out, they require special disposal because of the mercury – however minute! LEDs are the best! I love that this technology has progressed past indicator lights on computers. I am all about LEDs, but they are good ones and not so good ones (as my husband has recently discovered in his tinkering.) When choosing new bulbs, I always go for LEDs . They last even longer than CFLs and contain no mercury!!!!! I’m sure someone will eventually find a massive downside to these lights (science changes as new discoveries are made) but right now I love them. Bright/cool white runs about 3500-4100K has no yellowish glow, and in fact emits a whiter color. I find these lights sort of meh for craft rooms. Not the greatest and not the worst. However, if you are taking the time for new lights let’s go for the best possible. Now I do have to admit not all LEDs are equal (as I mentioned before.) My husband was tinkering with using the LED strip lighting as a potential for my sew room and I don’t think it emits enough light. It’s great for his work shop, but not so great for my sew room. We would need a lot of them for there to be enough light. (Keep in mind I am a bit older and will need bifocles in about 5-10 years…). So, in conclusion: daylight LEDs …seriously awesome stuff!